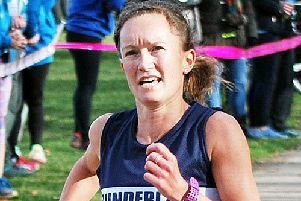 Sunderland Stroller Alyson Dixon has made further progress in her efforts to gain peak fitness for the European Championship marathon in Berlin in just four weeks. Competing in the Tyne Bridge Harriers Bridges of the Tyne 5, she finished in 10th place overall and beat the second woman to finish by three and a half minutes. Dixon clocked 27min 47sec for the five miler, which was just 17 seconds slower than her fastest on the course from 2014. She had been laid low from an inflamed heel bursa since the Commonwealth Games marathon and this was only her second competitive outing since then. But it was a far better performance than her Lambton Race effort 11 days previously, when she stated it was the hardest 10k she had ever run. The Bridges of the Tyne race was won by Morpeth Harrier Sam Hancox (25.21), who goes in the Sunderland 5k at Silksworth Sports Complex on Thursday. Tyne Bridge Harriers filled the next two positions in Tom Charlton (25.33) and James Dunce (26.14). Sunderland Harriers placed Kevin Jeffress in seventh (26.35), Michael Thompson 15th (28.32) Steve McMahon 16th (28.41) and Craig Gunn 21st (29.17). Penshaw Hill race winner Kurt Heron won Washington Running Club’s Bottoms Up Cup Race in a new course record (16.49) yesterday. The race, over approximately 5k, is a mixture of trail and paths in and around Princess Anne Park. Unfortunately, Sunderland Harrier Steven Duffy went off course, losing about 300 metres, when in an isolated second place and ended up finishing in fifth (19.17). Elvet Strider Gareth Pritchard moved into second spot (18.30) and in third place, and first veteran, was 57-year-old Sunderland Harrier Paul Collins (18.55), with his training pal, Steven Gordon, fourth (19.12). Jarrow and Hebburn’s Elaine Lesley won the women’s race in 21.41. Tyne Bridge Harrier Mark Fenwick (32.47) got the better of Sunderland’s Liam Taylor (33.17) to win the Tynedale 10k at Ovington. Sunderland Harrier Over-40 Ian Dixon finished fourth (34.17) and Kris Cantle was 51st (41.33). Sunderland Strollers were headed by Mark Anderson in seventh (35.28), while John Cook was ninth (35.55), Jamie Collin finished 14th (37.20), Andrew Duke was second Over-45 in 18th (37.40), Chris Duke was second Over-50 in 61st (41.59) and Malcolm Cox was second Over-60 in 73rd (43.17). Stroller Wendy Chapman. 49, finished runner-up (40.42) to Elswick’s Judith Nutt in the women’s race (39.05).